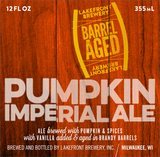 Our Brandy Barrel-Aged Imperial Pumpkin Ale pays homage to Lakefront’s formative years and to our Wisconsin roots. flavors in tow. Oak and malty sweetness linger on the palate; a reminder of how we’ve honed our craft over the years.